Much as with the first chapter of this Scarface story, the art’s rather simplistic…but expecting it this time and looking past it not being ‘great’ and just taking it as it is, it works very well here getting everything across that needs to be, at least in not taking me out of the story AS I read, and leaving me satisfied with the story at the end. Wesker and Woody make good on their escape–though it involves a brick-to-the-face and then hanging of Donnegan, and the murder of a couple of guards. We see Wesker falling prey to whatever madness Donnegan had–as the dummy seems to be the lead and the Ventriloquist following. We also get a sort of explanation for Scarface’s speech thing–his “B” having a “G” sound–as Wesker isn’t that great a ventriloquist. The story is fitting, and I’m definitely quite satisfied with this “origin” of Wesker as The Ventriloquist, and Scarface, how they came together and all that. I can certainly visualize this being summarized in a one or two page origin–perhaps that’s been done elsewhere already (in Countdown, perhaps?) but that’s mostly irrelevant for now. As a lead feature in an anthology title, it works, was an enjoyable read, and after the first chapter in the previous issue I was actually looking forward to this and trusting that it was to be a 2-part story and nothing longer. This “middle story” is a brief one, but interesting. Like the Wildcat piece in the previous issue, it’s singular and self-contained; a slice of life sorta thing. We meet Pax, a man bent on revenge against the alien parasites that slaughtered his people–the entire population of his world except he himself. As he narrates his story, it comes to light that the parasites can look like anyone, and we see him take on a group of them, killing them…and moving on. When he’s picked up by a group of “police,” he begins his narration again as we see that his hunt-and-kill mission continues. I had absolutely no idea what to think of this story at first. At the first page, I thought MAYBE this was Vandal Savage or someone of that nature, given the name “Pax,” but obviously I was quickly proven wrong in my assumption. The parasites appear to be the sort that we saw in Bloodlines–the Annuals event from 1993, which would make sense given this story would have been out just a few months after the end of that event in Bloodbath. And for a one-off story, seeing someone hunting the parasites would kinda show them to be a bigger deal than just the few that made it to Earth and caused the trouble they did. The lack of expectation going in, of even knowing what the segment was to be about, worked in its favor. The art fits, gets stuff across quite effectively; and has little to be compared to on this read-through. The story itself is ultimately forgettable, but still worth having read it. Reading this in 2016, though, it puts me in mind of 2014’s Armor Hunters from Valiant…as the lone survivor of a planet hunting down parasites like those that destroyed his planet, with singular vision and little regard for the consequences beyond killing the parasites. Thinking of it as the likes of Armor Hunters actually makes me like it all the more. While I wouldn’t care for any sort of dedicated mini-series or ongoing series like this…as a “random” thing in an issue I’m reading anyway, it’s well worth the several minutes of reading and realization! Once more, the final part of the issue is the selling point, the story I read the issue for. We pick up on Monarch holding Waverider and Hunter in a stasis field. Though he’s able to get them into the timestream, he lacks the control to direct himself, and hopes to have Waverider use his power to do that–and in the doing he’ll learn it for himself. Things don’t go as planned, and Monarch–Hank Hall–learns a new “truth” of his past and what happened at the end of Armageddon 2001, and since he’s more powerful than he’d realized, and his future self had realized, as Time’s been altered, he decides instead of being Monarch, he’ll be Extant! And stealing Waverider’s Linear Men arm-control, disappears into the timestream. 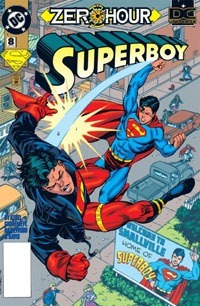 Hunter is suitably cheesed-off that the villain now has the ability to time-travel at will, and Waverider suggests that if this villain can uphold his potential, they stand at the edge of a true CRISIS. Yep, 9-ish years after “THE” Crisis (on Infinite Earths), a new one is about to unfold. As with the previous issue’s segment of this story, the art works well, if not being completely to my liking. The story also works, feeding us directly into Zero Hour, and revealing that this story was primarily about transforming Monarch (Hank Hall) into Extant, a sleeker and cooler-looking guy than the clunky Monarch was, but without having to “corrupt” any other characters. This also allows the character to come with built-in, already-established “street cred” AS a villain, extremely powerful and a true threat beyond any single hero’s ability to take him down. Despite this, I originally read Zero Hour withOUT having read this prelude, and had no problem following along (that I recall), and it wasn’t until I read the collected edition that I got to read this…so Sum: Zero is not absolutely essential…but it’s satisfying as a piece of my completist mentality for this reading project. I’m glad I didn’t pay full price for this back in the day, as I would certainly NOT have appreciated the lead story nor the Pax segment…and probably, honestly, wouldn’t even have appreciated the Zero Hour piece. Reading it in 2016 having paid a dollar or less for both chapters, it’s a very satisfying read and well worth the expense and the time. 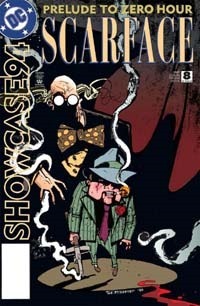 And for reading the entire issue for both of these Showcase comics, I now have a better idea of the “origin” of the Bat-villain The Ventriloquist/Scarface. It’s an anthology book, with a mix of creators both known and not, and characters that didn’t headline their own series, and all that, and it feels like one. This two-issue “taste” is much more satisfying than I recall the Batman segments of the two issues that tied into Knightfall, though that could be the more than two decades’ additional life lived and my ability to appreciate stuff as a mid-thirties adult than when I was just barely a teenager. I don’t know exactly when, but I look forward at least to the idea of binge-reading the several years’ worth of Showcase ’90s. I know I’ve read the Zero Hour portion of this issue in the collected edition of the event…but until now, I’ve never actually read Showcase ’94 #8 itself as a standalone comic! I was surprised by it, and rather enjoyed the experience overall. This first story focuses on a prisoner in Blackgate–Donnegan–and how he gets a book on ventriloquism as a “joke” but ends up taking it fairly seriously. He even makes himself a dummy–carved from the wooden remains of the prison’s gallows. He and the dummy form an interesting relationship over the years…which leads to some conflict when a new prisoner, Arnold Wesker is assigned to Donnegan as a cellmate. Wesker is interested in the dummy and appreciates the “show” of ventriloquism. However, Donnegan is quite non-plussed at the perceived intrusion on his space, and commands Wesker to leave his dummy–“Woody”–alone. Wesker’s fascination leads him to investigate, which earns him a beating. Not long after, he seems to be hearing the dummy…even though Donnegan’s sound asleep. The visuals for this story are rather simplistic, and don’t really do much for me. I recognize the dummy, and Wesker, by prior knowledge of them, and the “iconic” look of the dummy, and Wesker’s glasses. Beyond that, the art’s rather generic and unappealing. Still, it works for the story overall, and doesn’t exactly disappoint me, as I had zero expectation going in. It’s certainly not a “selling point” for me, but since the point of my reading the issue isn’t even this “main feature,” it can have a pass. Story-wise, I liked this. All these years later and I’ve never consciously known–or at least retained–the origin of “The Ventriloquist” and “Scarface” (Woody). And this being (in part) an Alan Grant story (I don’t recall if he created the character to begin with, but I recognize him as one of the major writers on Batman stuff in the late-’80s/early-’90s) so that predisposed me to enjoy the story, and not write it off as just some throw-away story of a lesser-known Bat-villain. This is part one, and the fact that Wesker isn’t the original “Ventriloquist” (or there’s something a bit more messed up going on) is interesting, and I actually look forward to reading the next chapter. I’m not overly familiar with Wildcat. I know the name Ted Grant, and recognize the character from Geoff Johns‘ JSA stuff (assuming I’m not mixing THIS Wildcat with someone else). Since I’ve never read anything in particular focusing on the character, I have no real preconceived notions to bring into the reading experience. This is a short piece that finds Wildcat infiltrating a resurrection ceremony that seems to be–purportedly–to raise someone from the dead. Contextually we learn that the body to be raised is that of Ted’s friend Yolanda–who had attempted to become a new Wildcat…but she was apparently killed by Eclipso recently. 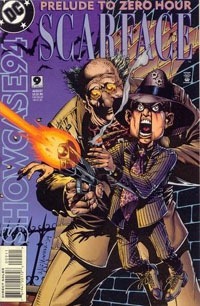 (I have yet to read but was aware OF the short-lived Eclipso series that spun out of the Eclipso: The Darkness Within and recall hearing about there being several character deaths in short order toward the latter part of the series–I always remembered The Creeper being killed, but apparently Yolanda/Wildcat was also one). Wildcat observes, and only intervenes when a “fake” Yolanda shows up. He busts the ceremony and the fake Wildcat, revealing the truth and bringing some closure (albeit uber-convenient and quick) to the family of the dead woman. This is a throw-away story, but recognizing it as a bit of follow-up to what I presume to be a virtually un-noticed otherwise death in a minor, now-forgotten book from the early-’90s, I can definitely appreciate its existence and purpose. At the least, it reminded me that that Eclipso series is out there and I’ve not yet acquired it, though I’ve had an interest in it for a couple decades now. The art’s slightly over the top in a way, but not bad. I don’t recognize the art team’s names, but it’s not a bad piece. That this short “slice of life” episode IS so short but actually ends without a cliffhanger suggests to me that it’s a one-off piece in this anthology series…so it’s not even long enough for me to develop much opinion one way or the other. The primary drawback to the piece at all is that it stood between me and the Zero Hour story. Vanishing Point–a place beyond Time itself, headquarters of the Linear Men. Hunter finds Waverider reminiscing, and confronts him over the fact that he–Waverider–may have stopped Monarch, but himself wiped out an entire timeline in the doing, making him worse than Monarch ever was. Waverider, though, doesn’t share the sentiment–though he does realize perhaps he should check into things with Hank Hall a bit more…though what he sees disturbs him. When he (and tag-along Hunter) journey to the late 20th century to investigate an anomaly that could be Monarch’s doing, they find him waiting, and themselves quite unprepared for this. This piece is the “selling point” of the issue for me; the entire reason I picked the issue up to read. I’m pretty familiar with it already from having read the Zero Hour collected volume at least a couple times over the years, but this might be the first time actually reading it as part of this Showcase issue, in this exact format. Trying to evaluate the art as a standalone thing, I realize it feels just a bit “off” somehow…probably because of not being Jurgens‘ art, or some such. It’s not bad by any means–and both Waverider and Hunter are familiar and distinct, and the imagery we get of Monarch and other elements that ought to be familiar from Armageddon 2001 fit, and convey the story. The writing is Jurgens, and as a prologue to the Zero Hour event, this fits perfectly into stuff, giving us a bit of story involving these characters just prior to their stepping into that event. I thought about “just” touching on the Zero Hour story and “ignoring” the rest of the issue, but figured why not just read the whole thing? And I was pleasantly surprised. I got a chapter of a story fleshing out the background of a Bat-villain that isn’t the bore I might’ve thought it’d be. The Wildcat story wasn’t bad and its primary drawback was that I finished the Scarface story and was a bit surprised to not turn right into the Zero Hour story. While the issue’s page numbering INCLUDES ad pages, it goes to page 46…which is much longer than “just” 20-22 pages, so even with ads, it’s roughly a double-sized issue for not much more than a standard-length issue would have been at the time. Considering I paid fifty cents or less for the issue, the time it took to read vs. the amount spent makes it an excellent value; I enjoyed the reading experience, and when adding the time spent writing up this post, means that it’s by far one of the highest-value comics I’ve read in quite awhile, holding/being the focus of my attention for so long. "Traditionally," this is one of my favorite Age of Apocalypse issues. As much as anything tied to the larger AoA epic really is, this is a self-contained issue, functionally a one-shot. And it’s double-sized, a larger chunk of story in one go than anything but X-Men: Alpha itself so far. Everything else to this point has been set in the "present-day," the contemporary X-Universe of the time, 20 years after the death of Xavier. This issue is set some years earlier than that–at the dawn of the Age of Apocalypse itself, at Apocalypse’s "first strike" of sorts, against humanity at large. We meet a young-ish Magneto training his band of X-Men in a secret location in the mountains. The group is introduced to a new teammate–the older and more dangerous man known as Logan…or Weapon X. As training draws to a close, a second new member is brought to their location–a young woman named Rogue. Amidst all this, Apocalypse strikes…forcing Magneto into action sooner than he’d expected. And while he and his young mutants fight off Apocalypse’s minions…another strike is carried out against their home. Probably the most "glaring" thing about this issue–for me–was a narration box stating (after introducing the characters) "Together, they from the mutant team known as…the X-Men." They FROM the mutant team? Not form–eff oh are emm–they "from" it? A simple transposing of two letters, but for me it stands out in a huge way. Maybe it’s been corrected in digital reprints or other reprint editions, but I’m pointedly reading the single issues that were actually put out at the time. But to be frank on it…if the worst I see in editing is a spelling glitch and I’m not grousing about huge giant plot-holes or character inconsistencies…I’d say things are going pretty well on that front. Being human, I can forgive the only spelling error I’ve noticed in however many issues so far. The art has an interesting flavor to it, feeling at once "typical ’90s" to me and yet definitely conveys an "older" tone just from the look, even though the story is pointedly set in the past. As I often find myself saying: the visuals don’t blow me away, but they were quite well for the issue and I didn’t particularly notice anything worth grousing about. Given the real-world quantity of comics chronicling the adventures of the X-Men through the years and the amount of time purported to have passed for these characters…there is still a huge body of stories that could be told of the characters in this Age of Apocalypse timeline. At the time this was published, everything was ‘face value’ and this issue was the sole, primary glimpse into "the past" of the characters, giving us one of THE key stories–that of Apocalypse’s first strike against humanity as well as the fate of the Scarlet Witch. And this has that feel…sort of like having all these contemporary issues, but then picking up an old issue and reading a good story that "still matters" in current continuity. While I’m consciously aware of plenty of "Untold Tales from the Age of Apocalypse" stories that eventually came out, this is the first and one of the best. We see a version of the characters both familiar yet different…but not yet as "dark" as they are by "present day." This gives us–as readers–the chance to witness the introductions of Rogue and Weapon X to the team, Apocalypse striking out, without having to solely be "told" it happened. It’s also rather nice to get "just" a story of these X-Men that does not directly tie to the premise of the main epic, of bringing pieces together for the final showdown at the end of the Age of Apocalypse. Knowing solely the basic premise–that Xavier was killed in the past and Magneto formed the X-Men instead–one can easily read and enjoy this issue in and of itself as a one-shot without even having to read any of the other Age of Apocalypse issues. To me, this truly is Age of Apocalypse done right…unlike most everything done SINCE the 1990s involving the timeline. I was eager to get to this issue for what I remembered as a focus on Nightcrawler. While it’s not quite AS focused on the character as I thought I remembered, there’s still enough, and I found it rather interesting to revisit the character and address some perceived issues with more contemporary takes on the character. In a quasi-cinematic or television-like way, the issue opens with an extended scene of a mutant being ferried and guided to Avalon…a haven for mutants and humans, in the Antarctic (a tamed Savage Land, apparently). We then jump back to the U.S., to Manhattan, where we catch up with Nightcrawler who is securing transit from America TO the Antarctic by way of Warren Worthington–Angel–at Heaven. Angel claims to have gone "legit" and not want to deal with "terrorists" like Magneto and his X-Men, but Kurt has none of it and we see there’s no love between the two. Meanwhile, Magneto converses with Mystique, informing her of why she will welcome her son and take him to Avalon to extract Destiny. Back in Avalon, the young mutant arrives and is introduced to Destiny…who promptly has a horrifying vision of the Apocalypse. Visually, I quite enjoyed this issue. I really liked several of the panels of Nightcrawler in particular, and generally found myself rather appreciative of the way characters were shown. Aside from the art in and of itself I certainly appreciate what appears to my issue-by-issue eye to be a consistency in costuming with characters–and in this case specifically, Magneto. Nothing about him stands out as contradictory to other appearances…such contradictions being something some part of me pretty much would "expect" based on contemporary comics where the import seems to lie on the individual vision and touches over a consistency and continuity. I like the story…from the pacing with the opening, getting into the heart of things; learning details of what Kurt’s to do, foreshadowing of what he’ll be facing, character appearances, and so on. I’m a little more conscious now of the author–that this is a Warren Ellis story, and in the back of my mind that influenced my reading, though this doesn’t exactly have the "feel" of a Warren Ellis story (whatever that would actually be). Yet I suppose I attribute stuff like the opening to an Ellis-style. There’s a darkness I did not recall, especially to Nightcrawler…but that puts the character in line with the contemporary version, putting that into a different light than I anticipated going into this issue. I didn’t and don’t remember much detail from this series from all those years ago when I first read it, but this time through was rather enjoyable. I think even having overall broad-stroke memories of the Age of Apocalypse books, I’m getting added enjoyment from this re-reading project from the fact that I apparently never have actually gone back through and re-read the entire thing…so the faded memories and lack of details retained make the reading similar to reading something for the first time. Of course…I’m especially looking forward to Amazing X-Men and X-Men Chronicles to finish out the month. 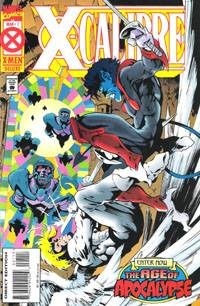 But I’m also looking forward to the next issue of this mini and further experience with Nightcrawler. 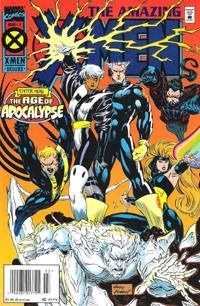 With this issue, we’re back to the X-Men "proper," as Storm and Quicksilver lead a squad of X-Men to assist with getting humans out of North America. In order to do so, however, they have to "hack" the High Council’s sentinels’ programming so they can be seen as friendlies and not just more mutants to be attacked on detection. Though they seek to help, their help’s not asked for. As the group preps, the distrust for the man called Bishop runs high as Magneto seems to be the only one who trusts him and believes that he might truly represent a chance to change the world before it ever went wrong. It’s not really evident to me with this issue why I’ve long held this title to be my favorite of the Age of Apocalypse books–it might be the later issues that brought that to the fore and the way they lead into the end of things…but that’s something to be gotten to when I get to ’em. This issue is another solid read with plenty of forward development in things as a whole if not overly so with any individual characters. Of course, it’s a team book so I wouldn’t necessarily expect a lot of individual character development. 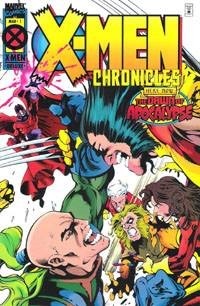 I certainly appreciate the Magneto/Bishop stuff, and rereading all these first issues has reminded me of why I’m such a fan of Magneto, as it WAS this saga 20 years ago that fully introduced me to the character, my prior experience having almost exclusively been Fatal Attractions and the animated series (which itself in its second season gave plenty to like with the character). The story here is good, as is the art. I can be quite repetitive in talking about art with comics as I’m more a story guy, but with that–this issue’s art didn’t blow me away but it definitely provided strong visuals that certainly had played a part in defining this era of X-Men comics for me. All in all, this was another enjoyable issue in the dawn of the Age of Apocalypse…keeping the "train" rolling and my interest high in continuing to relearn and revisit the entirety of the AoA epic. On a more pronounced scale than X-Man #1, I remember disliking this series and so kinda "dreaded" "having to" read it to progress through the Age of Apocalypse saga. I know present-day I tend to not care for Bachalo‘s visual style, finding it cluttered and often hard to follow in the flow of just reading the story. But I actually rather enjoyed this issue. 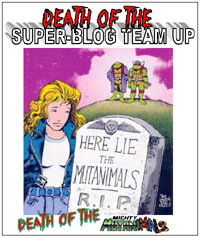 The bulk of the issue follows a "training exercise" in which the younger mutants fight–Danger Room style–as training in use of their powers. First against each other, and then against their teachers–Colossus and Shadowcat, who prove to be quite ruthless and deadly, and encourage the same in their students. "Training" gets cut short with the appearance of Magneto, who (in his first "live" appearance to the kids) has Bishop in tow and seeks discovery of a possible time traveler…who, as it turns out may well be the sister Colossus thought killed. It will be up to this team of mutants to retrieve her. As said, I haven’t really cared for Bachalo‘s work in more contemporary comics, and as such really was not looking forward to this issue. But I actually forgot as I read that this was a Bachalo-drawn issue, as the problems I’ve had with more recent stuff he’s done does not seem to be apparent here. I don’t know if that’s the inks, colors, pencil styles, or what. Whatever it is, I’m thankful, as this issue thusly has a distinct grittier, darker tone than the other issues I’ve read so far of the Age of Apocalypse #1s…setting it apart but not distractingly so. The story isn’t bad…it doesn’t blow me away and is actually fairly cliché in its own way…but it works here, setting tone and showing the harshness of things these kids are facing (though we don’t get much explanation for Kitty’s behavior/personality compared to her non-AoA self). 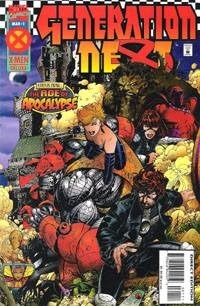 While I have YET to read the Phalanx Covenant in full and really much with all the Generation X characters, I always found the timing of this interesting: by the end of the Age of Apocalypse stuff, there’d been equal time spent with Generation X as a title as this Generation Next…4 issues and 4 issues. Not a bad read, certainly much more enjoyable than I remembered or expected…we’ll see what the later issues do for me.